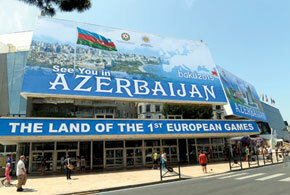 Invitations to the first ever European Games, Baku, 12 June 2015, have now been sent out. Thousands of top athletes from 19 different disciplines will compete in the Games, testing themselves at European level one year before the summer Olympics in Rio de Janeiro. At a celebratory dinner to mark the one-year count down, representatives of Europe’s National Olympic Committees received official invitations to bring their teams to Baku 2015. At the symbolic time of 20:15, the president of the European Olympic Committees (EOC), Patrick Hickey, handed out the invitations made out of antique Azerbaijani carpet, a unique emblem of the country. Proudly counting down the days are two official Games countdown clocks provided by Swiss watchmaker Tissot. One stands in the middle of the Azneft roundabout in central Baku, the other at Heydar Aliyev International Airport, both unveiled on 11 June during the One Year to Go celebrations. In agreement with Baku 2015 European Games, Tissot and its sister company in the Swatch Group, Swiss Timing, will keep track of the times and scores of athletes as they run, hurdle and vault to their limits. Tissot will also swirl out a marketing campaign to promote the partnership across its worldwide distribution network. Swiss Timing brings a wealth of experience to Baku, having recorded times and measurements at every Olympic Games since 1976. The most spectacular of the One Year to Go events was a magnificent firework display on Baku’s seafront Boulevard on 12 June. Organisers circulated leaflets to recruit volunteers to help at the Games. With 10,000 places available, both Azerbaijanis and expatriates are wanted to assist in the smooth-running of the biggest event the country has ever staged. Would-be volunteers can apply online via the baku2015.com website. Stressing the important role of the volunteers, Azad Rahimov, Azerbaijan’s minister of youth and sports and chief executive of Baku 2015, said: Being a volunteer at the first ever European Games is a wonderful opportunity to play a part in Azerbaijan’s history by helping to make the event a success. Baku 2015 will show the world that Azerbaijan is a young, modern and welcoming European country and I hope that our volunteers will reflect the very best of the good people of Baku. Two famous Olympians have visited Baku in the run-up to the Games: four-time Olympic champions, US sprinter Michael Johnson and Russian swimmer Vladimir Salnikov. 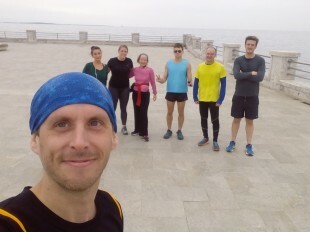 Johnson met young Azerbaijani athletes and showed his friendly-competitive side in Olympic Day celebrations on Baku Boulevard on 23 June. The former sprinter, an ambassador for BP in Azerbaijan which is one of Baku 2015’s official partners, visited the Baku European Games Organising Committee (BEGOC) headquarters. He also toured the Athletes Village, witnessing the construction of the National Stadium as it progresses. It has been a pleasure to be in Baku this week and witness the growing enthusiasm for sport in Azerbaijan. I understand how much of an inspiration a home Games can be, and the first European Games is a fantastic opportunity for the athletes of this country to make history and achieve success, Michael Johnson told the Games website, Baku2015.com. Salnikov visited the BEGOC headquarters at the end of June, too, and was escorted round the National Gymnastics Arena, Crystal Hall and the Baku Aquatics Centre, which is currently under construction. The European Games is a complex event featuring 19 different sports. The organisation must be fine-tuned for success. Test events are under way to try out venues and other facilities. This included the European Youth Olympic Trials (EYOT), which were held from 30 May to 1 June at Baku’s Tofiq Bahramov Stadium. 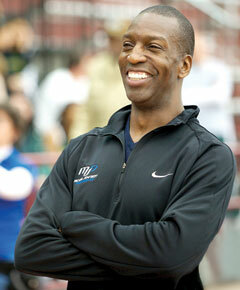 Jose Luis de Carlos, senior vice president of European Athletics, was pleased with the trials. European Athletics is very happy and impressed by the exceptionally high level of organisation displayed by our Azerbaijani friends, he told the Baku2015.com website. The Azerbaijan Athletics Federation (AAF) were given a very short period of time to organise this event but they have done an excellent job and we are now looking forward to working with them on a successful European Athletics Team Championships 3rd League as part of the European Games. The trials, which saw 678 of Europe’s finest young athletes compete in 36 events, was the first ever international athletics meeting staged in Azerbaijan. A total of 931 athletes and team officials stayed in the newly built Athletes Village throughout the competition, trying out the accommodation in advance of the European athletes to come. Azerbaijan’s First Lady and BEGOC Chairwoman Mehriban Aliyeva and Games Chief Executive Azad Rahimov attended the second Azerbaijani cultural festival in the French city of Cannes in July. Their mission was to raise awareness of the Games across Europe. Addressing the opening of the Baku 2015 European Games Exhibition, the First Lady said: Taking this opportunity, I invite you to visit our country. I’m hopeful that visiting our country during the first European Games, you will have a chance to acquaint yourselves with the history, culture of Azerbaijan, architectural monuments linking the East with the West, and traditions of the country. 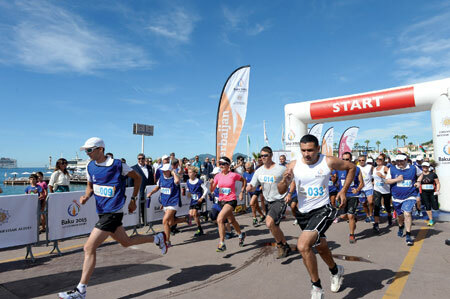 Other events included a formal dinner hosted by Cannes Mayor David Lisnard, the Festival d’Art Pyrotechnique in which Azerbaijan participated, and a race along Cannes’ famous Promenade de la Croisette. Leyla Aliyeva, vice-president of the Heydar Aliyev Foundation, was one of the runners. The race was a very friendly one, winner Maxence Vaudelin, 25, told Euronews. The First Lady presented Maxence and other winners with their prizes, which included tickets to the European Games. As preparations gather momentum, the first participants have embarked on the Baku 2015 European Games’ Graduate Excellence Programme. The young talent pool of 45 graduates, 38 from Azerbaijan and seven from Croatia, Greece, Lithuania, Portugal, Slovakia, Slovenia and Turkey respectively, arrived in Baku in July. After three weeks of intensive training organised by the Games Academy, they are now working in BEGOC with responsibility for planning and delivering aspects of the Games. Around 150 more graduates will join the programme between August and October. The programme is designed to develop skills and knowledge locally and internationally in order to create a personnel legacy of competent sports administrators and organisers to work on future events. Multinational heavyweights Procter & Gamble, BP and McDonald’s have signed up to support the Games. As an official partner, Procter & Gamble will promote Baku 2015 via its brands, which include Max Factor, Gillette and Olay, in Azerbaijan. BP is the oil and gas partner for the Games and the exclusive partner of the Games Academy. It will boost elite athlete development in Azerbaijan, backing the host nation’s aspiring medal hopes. McDonald’s, meanwhile, is an official supporter of the Games, and will promote the Games in its popular country-wide restaurants. Nar Mobile, Azerbaijan’s fastest-growing mobile operator, is the Games’ first national partner. Nar Mobile will be the official mobile telecommunications service provider for the tournament and will provide extensive coverage across the whole of Azerbaijan. When and where can I get tickets? To answer all fans, tickets are to go on sale in 2015. They will be sold online and at city centre box offices. Greek company Tickethour, the Games’ “official ticketing supporter”, will supply its software system and management team to handle the flow of bookings, as it did for Athens 2004 Olympic and Paralympic Games. There are approximately one million tickets up for grabs.